Grown for its brightly colored fruit, ornamental pepper plant is not particularly attractive until it becomes loaded with ripening peppers in fall and winter. Another common name for this plant is Christmas Pepper. 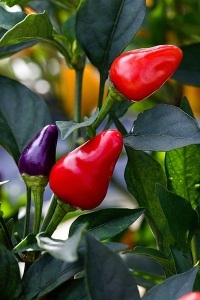 C. annuum puts on a spectacular display when covered with a bounty of colorful peppers. However, it's a one-time production. 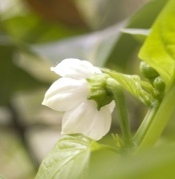 You can expect ornamental peppers to produce fruit for up to 6 weeks. 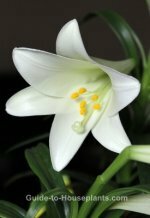 It will not bear fruit again and is usually treated as a temporary house plant and discarded when it is no longer attractive. White, star-shaped flowers grow in the leaf axils in summer and early fall, followed by the real star of the show -- colorful peppers. They may be cone-shaped or round, depending on the variety. But the peppers all change colors as they mature -- from green to yellow to orange to red. Some varieties have purple fruit that is almost black. These are often sold as holiday plants for their resemblance to tree lights. Choose whatever tickles your fancy... there are many good varieties to choose from. 'Black Pearl' (shown at left) is a popular cultivar with round, dark-purple peppers that turn almost black...and unusual dark foliage, making this a striking ornamental. 'Holiday Cheer' features small, round peppers that change from yellow to purple to red. 'Fireball' is compact with round peppers that go from cream to orange to red as they mature. Pinch your plant. Pinch new growth to encourage the stems to branch out and become bushy. Some like it hot. Keep this tropical native warm. 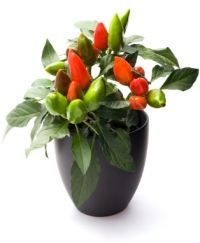 Ornamental chili pepper is tender and should not be exposed to temperatures below 55°F/13°C. CAUTION: The peppers are edible, but most are fiery hot. The juice from them can cause painful burning of the eyes and mouth. Keep plants away from small children and wash your hands thoroughly after handling the peppers. Light: Bright light, including at least 4 hours a day of direct sun. Water: Keep soil evenly moist. Leaves will drop if soil is too wet or too dry. Water thoroughly and discard drainage. Humidity: Average to moderate humidity (around 50% relative humidity). Keep your ornamental pepper plant away from drafts and heat vents. Hot, dry air will cause the leaves to shrivel and turn brown. Dry conditions also attract spider mites. Mist the foliage with tepid water to raise the humidity around it. Fertilizer: Feed monthly. Tomato fertilizer works great for your peppers, too. Propagation: Seed. Sow seeds in spring.